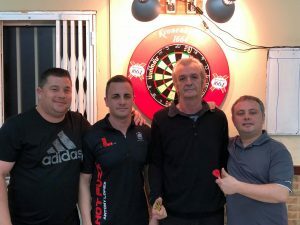 2nd Leg – Antony starts well with a Maximum 180 but this was followed by doubles misses from Antony, Dylan & Justin before Manolo was able to checkout on Double 4 to level the match. 3rd Leg – Both teams scored well, keeping up with each other. This time Justin hit the Double 10 with his 2nd dart with his opponents trailing on 60. 4th Leg – Dylan showed his determination early on with a Maximum 180 and both pairs scored well. Manolo missed a Double 20 for the win which allowed Antony an opportunity to level the match which he was unable to do, also missing Double 20. Justin did not miss however and with the Double 20 checkout secured the win. Commiserations to Antony Lopez & Dylan Duo, Congratulations to Justin Broton & Manolo Vilerio! Jarvis Bautista 156, David Francis 121.